Bowser's Castle Break-In (known as Baby Bowser's Castle Break-In in the British English version) is the eighth level of World 6 found in Yoshi's New Island. Yoshi starts the level outside a castle with some enemies along with Kamek flying in the background, with the Checkpoint Ring nearby. 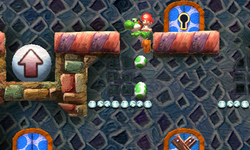 A rising platform takes Yoshi in the castle with the bottom-left door having some Mace Guys and a key. The bottom-right door has Tap-Tap the Golden which needs to be knocked back enough to get the key. The top-left door has Yoshi riding on a moving platform and hitting a Winged Cloud in order to get the key. The top-right door has Yoshi bouncing on Skeleton Goonies in order to get the key. The center door, when unlocked, leads to another locked door, which leads to a Checkpoint Ring and a locked door. This door leads to a locked door, which leads to an area with a pipe. The pipe leads to a Mega Eggdozer which must be hit at some rocks in order for Yoshi to open the nearby door. It leads to a room where Kamek chases after the Yoshi and fires magic blasts at him, as well as a Checkpoint Ring and the boss door. Baby Bowser can be defeated by throwing an egg at him three times, however Kamek powers him up into his giant form. This form can be defeated by throwing a Mega Eggdozer at him three times. After Baby Bowser has fallen, Yoshi will then go and rescue Baby Luigi and the Stork. However, if the player manages to complete all the main levels without using the Flutter Wings, Bowser will appear out of nowhere, and he'll have to be fought in the next level. This page was last edited on April 10, 2019, at 10:19.